This training course begins with an introduction to the concepts of Distributed Machine Learning. We'll discuss the reasons as to why and when you should consider training your machine learning model within a distributed environment. We’ll introduce you to Apache Spark and how it can be used to perform machine learning both at scale and speed. Apache Spark is an open-source cluster-computing framework. We’ll introduce you to Amazon’s Elastic MapReduce service, or EMR for short. EMR provides a managed Hadoop framework that makes it easy, fast, and cost-effective to process vast amounts of data. EMR can be easily configured to host Apache Spark. We’ll introduce you to MLlib which is Spark’s machine learning module. We’ll discuss how MLlib can be used to perform various machine learning tasks. For this course, we'll focus our attention on decision trees as a machine learning method which the MLlib module supports. A decision tree is a type of supervised machine learning algorithm used often for classification problems. We’ll introduce you to AWS Glue. AWS Glue is a fully managed extract, transform, and load service, ETL for short. We’ll show you how AWS Glue can be used to prepare our datasets before they are used to train our machine learning models. Finally, we’ll show you how to use each of the aforementioned services together to launch an EMR cluster configured and pre-installed with Apache Spark for the purpose of training a machine learning model using a decision tree. This demonstration will provide an end-to-end solution that provides machine learning predictive capabilities. Create your own distributed machine learning environment consisting of Apache Spark, MLlib, and Elastic MapReduce. We’ll review AWS Glue. 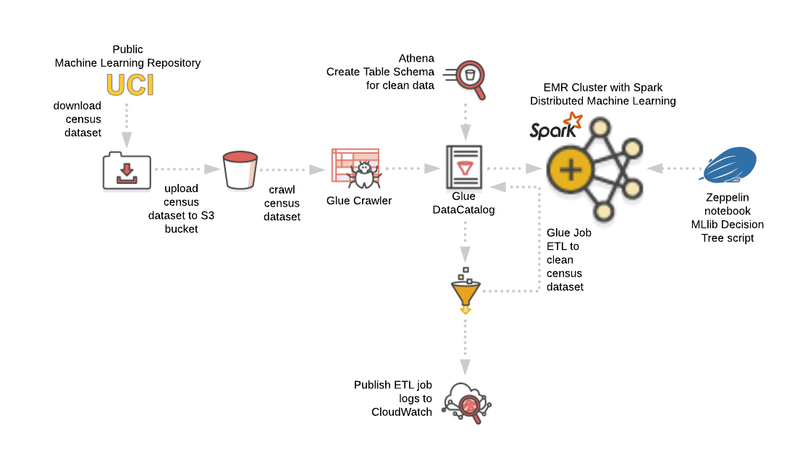 We’ll show you how you can use AWS Glue to perform ETL to prepare our datasets for ingestion into a machine learning pipeline. - [Trainer] Hello and welcome to this Cloud Academy course on Distributed Machine Learning. In this first lecture, we will cover off the course agenda, intended audience, and course requirements. Before we start, I would like to introduce myself. My name is Jeremy Cook. 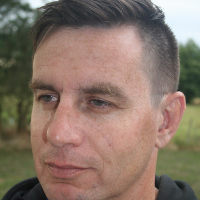 I'm one of the trainers here at Cloud Academy, specializing in AWS. Feel free to connect with either myself or the wider team hear at Cloud Academy regarding anything about this course. You can email us at support@cloudacademy.com or alternatively, our online community forum is available for your feedback. This training course begins with an introduction to the concepts of distributed machine learning. We will discuss the reasons as to why and when you should consider training your machine learning model within a distributed environment. We'll introduce you to Apache Spark and how it can be used to perform machine learning both at scale and speed. Apache Spark is a lightning fast, open-source, cluster-computing framework. We'll introduce you to Amazon's Elastic MapReduce service, or EMR for short. EMR provides a managed high-tech framework that makes it easy, fast, and cost-effective to process fast amounts of data. EMR can be easily configured to host Apache Spark. We'll introduce you to MLlib, which is Spark's machine learning module. We'll discuss how MLlib can be used to perform various machine learning tasks. For this course, we will focus our teaching on Decision Trees as a machine learning method, and for which the MLLib module supports. A Decision Tree is a type of supervised machine learning algorithm used often for classification problems. We'll introduce you to AWS Glue. AWS Glue is a fully-managed extract transform and load service, ETL, for short. We'll show you how AWS Glue can be used to prepare our data sets before they are used to train our machine learning models. Finally, we'll show how you to use each of the aforementioned services together to launch an EMR cluster, configured and pre-installed with Apache Spark for the purpose of training a machine learning model using a Decision Tree. This demonstration will provide an end-to-end solution that provides machine learning productive capabilities. The intended audience for this course includes: data scientists and/or data analysts; anyone interested in learning and performing Distributed Machine Learning or machine learning at scale; and anyone within an interest in Apache Spark and/or Amazon Elastic MapReduce. By completing this course, you will understand what Distributed Machine Learning is and what it offers; understand the benefits of Apache Spark and Elastic MapReduce; understand Spark Mllib as a machine learning framework; create your own Distributed Machine Learning environment consisting of Apache Spark, MLLib, and Elastic MapReduce; understand how to use AWS Glue to perform ETL on your data sets in preparation for training your machine learning model; know how to operate and execute a Zeppelin Notebook, resulting in job submission to your Spark cluster; understand what a machine learning Decision Tree is and how to code one using MLLib. The agenda for the remainder of this course is as follows: we'll discuss what Distributed Machine Learning is and when and why you might consider using it; we'll review the Apache Spark application and its MLLib machine learning module; we'll review the Elastic MapReduce service; we'll provide an understanding of what a Decision Tree is, and what types of analytical problems it is suited towards; we will review the basics of using Apache Zeppelin Notebooks, which can be used for interactive machine learning sessions; we'll review AWS Glue; we'll show you how you can use AWS Glue to perform ATL to prepare our data sets for ingestion to a machine learning pipeline; finally, we'll present a demonstration of a fully-functional Distributed Machine Learning environment implemented using Spark running on top of an EMR cluster. The following prerequisites will be both useful and hopeful for this course: general development and coding experience; AWS VPC networking and IAM security experience. Furthermore, if you require an introduction to machine learning in general and/or Amazon Elastic MapReduce concepts, then please consider taking the following related courses here on Cloud Academy. Okay, the course introduction has now been completed. Go ahead and close this lecture and we'll see you in the next one where we'll begin discussing Distributed Machine Learning concepts.